Transition from umbra to penumbra shows changes in magnetic field. The interface between a sunspot’s umbra (dark center) and penumbra (lighter outer region) shows a complex structure with narrow, almost horizontal (lighter to white) filaments embedded in a background having a more vertical (darker to black) magnetic field. Farther out, extended patches of horizontal field dominate. 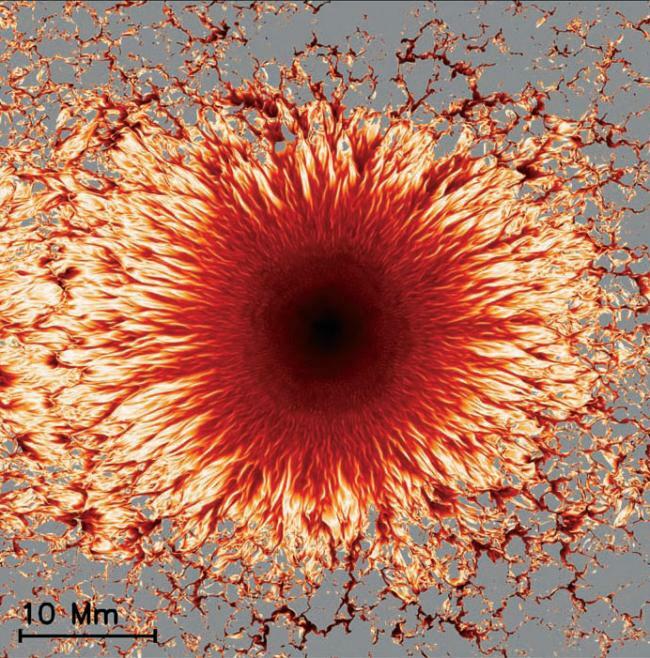 For the first time, NCAR scientists and colleagues have modeled this complex structure in a comprehensive 3D computer simulation, giving scientists their first glimpse below the visible surface to understand the underlying physical processes. In a breakthrough that will help scientists unlock mysteries of the Sun and its impacts on Earth, an international team of scientists from NCAR and the Max Planck Institute for Solar System Research (MPS) has created the first-ever comprehensive computer model of sunspots….